Emily Bass races away for Downs against Sunshine Coast at Ballymore. SCOTS PGC College Year 11 students Emily Bass and Demi Hayes have been selected in the Queensland Youth Girls (under-18) rugby sevens squad. The squad has been named ahead of the National Youth Girls Sevens Titles, which will be held in Sydney in February. In 2015 Australia will also be taking a team to the Youth Commonwealth Games in Samoa and the national championships will play a role as part of the selection process for this team. 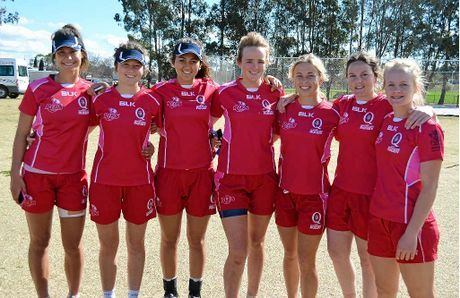 Emily and Demi are two of seven girls from Scots PGC who have been part of a Darling Downs development program, which saw them train in Toowoomba for the past six months with QRU development officer James O'Keefe. Over the past two weekends the Darling Downs development squad competed against other regions at Ballymore in a selection trial for the Queensland team. Rugby sevens is the second state team Emily and Demi have been selected for this year. The girls will be representing Queensland next month in athletics and touch football. Emily will be representing Queensland at the 2014 Australian All Schools Championships in Adelaide, where she will compete in the 400m hurdles. Demi will be travelling to Melbourne with the Queensland under-16 touch football team on a development tour. Both girls played junior rugby league in their home towns. Emily played for the Dirranbandi Frogs and Demi with the Tara Panthers. Scots PGC students in the Downs Development Squad (from left) Demi Hayes, Shayne Hayes, Tiffany Cullen, Brooke Lawson, Sam Cahill, Rylie Douglas and Emily Bass. Both are also Daily News/Warwick Credit Union Junior Sports Star of the Year monthly winners. The inclusion of rugby sevens in the Summer Olympic Games from 2016 has seen the sport rise in popularity. Director of activities Andy McGregor-Lowndes said Scots PGC students had seen the success of other girls in the region cross over from touch football and athletics to sevens and enjoy great success. 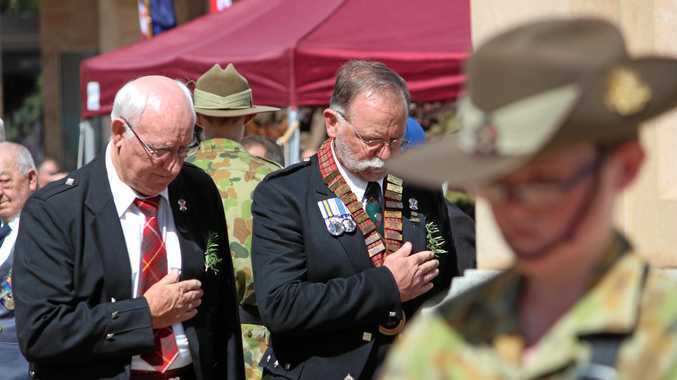 "You don't have to look any further than current IRB Sevens Player of the Year Emilee Cherry, who went to school in Toowoomba and made the transition to sevens after being talent-spotted playing representative touch football," he said. Demi said she had really enjoyed playing sevens this year and it was something she would like to focus on over the next 12-18 months. "I am very excited that I have been given this opportunity," she said. Emily said she was very happy to hear she had been included in the state squad. "I am looking forward to the challenge," she said.